Dowagers Hump is an excessive or hyper kyphosis of the upper thoracic spine. Usually the patient will have forward head carriage, winged scapulas and rounded shoulders. Most patients fear this as they have either seen their grandmother with one or they have seen the movie the Hunchback of Notre Dame. Usually patients fear this far more than if you tell them they have a disc herniation or stenosis as most people are simply vain. 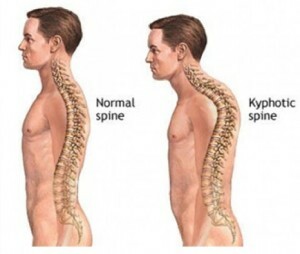 It is an exaggeration of the thoracic curvature and can be due to vertebral subluxations (misalignment’s of the vertebrae), osteoporosis (loss of bone density), poor posture, disc degeneration, Scheuermann’s disease, or anterior compression fractures. A mild dowagers hump will usually lead to headaches, upper back pain, neck pain, headaches, numbness and tingling of the arms and hands or weakness of the arms and hands. Severe cases of dowagers hump can affect your lungs, and other tissues and organs. Treatment for hyper kyphosis depends on your age, the cause of the curvature and its effects. It is more prevalent in girls and progresses with age. Dowagers Hump treatment can consist of maintaining good posture and sleeping on your back at all times. Sleeping on your side will make it worse. Stretching the chest muscles and strengthening the muscles of the mid and upper back. Specific Gonstead Chiropractic Adjustments can help correct vertebral subluxations that are causing poor posture. A posture shirt can help bring the shoulders and head back in line with the rest of the body. When standing, the ear, shoulder, hip, knee and ankle should line up in a straight line. Class IV High power laser therapy can help to loosen the pectoral muscles and increase range of motion in the neck. Active Release Technique can help increase range of motion.